Need help with a desk error code, a monitor arm that won't stay in the place you want it to, or a keyboard tray that won't raise or lower? Luckily, we've found that these issues can usually be fixed with the simple tips below. Are you seeing a R5T, ER1, ER2, ER7, or ER8 error code on your UPLIFT Desk digital keypad? Follow the directions below or watch our video to see how to perform a simple reset, which will generally fix the issue. The control box is the "brain" of your desk, and has many customizable functions. Our Programming Your UPLIFT Desk PDF includes instructions on locking the keypad, changing the memory presets from one-touch to press-and-hold, and setting new lower or upper height limits. Please note that this only works on control boxes with programming codes 99.039.14.0214 (2-leg), 99.046.14.0070 (3-leg), or 99.052.09.0019 (4-leg) printed on the sticker located near the power socket. If you have an older control box, you can purchase a programmable UPLIFT Desk control box. If your monitor arm isn't maintaining its position once you've raised or lowered it, it may need to be counterbalanced. Watch our quick demonstration on correctly counterbalancing your UPLIFT Monitor Arm. If your keyboard tray mechanism will not raise or lower, you may need to remove the shipping pin. To locate the shipping pin, see the image below. Simply lift up on the front of the tray & lower the back to relieve pressure on the shipping pin and remove it. If you are still experiencing issues after following the steps in any of our instructional videos, feel free to call us at 800-531-3746, email us or visit us in live chat, Monday - Friday, 8am - 7 pm, or Saturday, 10 am - 6 pm. 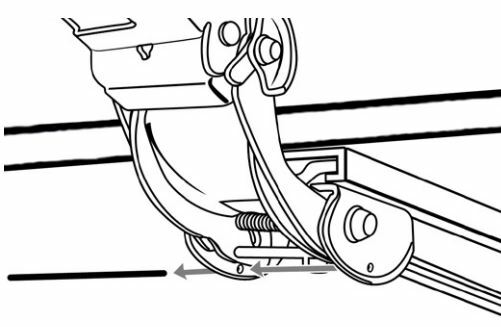 Looking for UPLIFT desk and accessory assembly instructions and tips? We have videos and downloadable materials available here. Q. Do you sell other products? Q. Do you have a regular newsletter I can sign up to receive? Q. My items arrived damaged, what should I do? Q. What is list price? We can be reached via phone ( 800-531-3746), email ( info@humansolution.com), or live chat from 8am - 7pm Monday - Friday and from 10am - 6pm Saturday. Our retail store and showroom in Austin, TX is located at 2139 West Anderson Lane and is open 10am - 6pm, Monday - Saturday. We have a wide variety of adjustable height desks and standing desk converters, ergonomic chairs, keyboards, mice, and many other products available to try before you buy. We want to help you get the perfect solution for your needs! In fact, when you call, chat or email us, our ergonomic experts use our showroom to try out the features that you're interested in so they can answer your questions perfectly! Our website is open 24 hours a day, 7 days a week, 365 days a year. View our Contact Us page for additional information. We can quote most commercially available office furniture products through our network of master distributors. Please email or call us for a quote on your needs. We appreciate the opportunity to quote your job! Yes we do. Sign up for our monthly newsletter for handy ergonomic tips, notification of sales, and exclusive email subscriber-only offers. We automatically send out email updates with expected ship dates and tracking information as soon as that information is available, and you can track your order on your account page. Yes. Please read the return instructions carefully as different policies apply to different items. If you have any questions, please feel free to call or email us for clarification. Please see our Returns page for full information on returns and order cancellations. If an item looks damaged or parts are missing, please notify us immediately. We will make every effort to help you obtain the necessary replacements as quickly as possible at no extra cost to you. Please hold onto any and all packaging materials until you have assembled and installed the item(s) in your order. This will help if you notice any damages upon receiving your item(s) or if you decide to return anything within the return period window. If your order is shipping by truck freight or white glove, please note the important instructions below. If you have already accepted the package and find that parts are missing or damaged, please contact us right away and we will ship you the replacement parts free of charge. Speed matters since most carriers only let us file freight claims within 48 hours of delivery. We will ask for photos of the damaged item(s) and packaging. If we cannot replace the parts, we will have the carrier pick up the package and we will send you a replacement. All returned products should be in the original packaging. The list price is the same as the MSRP (Manufacturer's Suggested Retail Price). It may not necessarily be the price at which the product is sold.